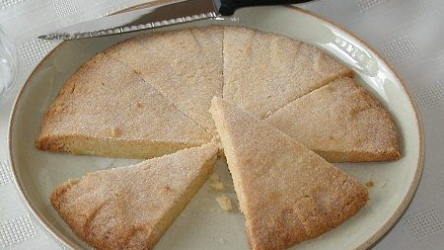 Shortbread is a British food recipe for a type of biscuit. Grease a cookie sheet with margarine or butter and set aside. Beat ½ cup butter and 3 tbsp sugar to a light, frothy texture. Stir in flour as lightly as possible until mixture is like fine bread crumbs. Turn mixture onto a floured surface and knead gently until it forms a smooth dough. Form dough into a circle 6 inches in diameter and ½-inch thick and transfer it to the cookie sheet. Prick surface of dough lightly with a fork. Refrigerate dough for 20 minutes. Preheat the oven to 350F. Bake shortbread for 30 minutes. Then turn the oven down to 300F and bake for 30 to 40 more minutes, until it is crisp and lightly browned. Remove the cookie sheet from the oven. 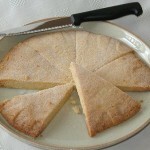 With a sharp knife, cut shortbread into 8 triangles. Let triangles cool slightly on the cookie sheet, then transfer to a wire rack to cool completely. Serve shortbread immediately or store in an airtight container.